May has just begun, but there is already quite a bit of news about the manga and novel series for Kingdom Hearts. The final volume of the Kingdom Hearts II manga had been pushed back from May 23rd to May 30th 2017. 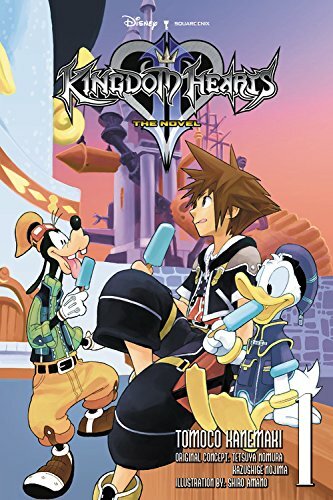 The cover art for the first volume of KINGDOM HEARTS II: The Novel and the release date for the second volume of KINGDOM HEARTS II: The Novel has been revealed. Kingdom Hearts II: The Novel Volume 2 by written Tomoco Kanemaki and illustrated by Shiro Amano will release on December 12th 2017 for $16 USD and be published under Yen On, Yen Press' light novel imprint. The second volume contains 272 pages and you can preorder it right now from Amazon and Barnes & Noble. Y'all don't know how hyped I am for these novels. GP's translations and the few summaries out there have kept me alive all of these years, but now I can sit and feel happier that we will finally see more into Sora's head during this game. Nice, can't wait! I never got to read any fan translations, so this is entirely new for me. I can understand the hype for these very well and I'll certainly import those babies, lolz. I think they defintely will! They also sold the novels to KH1 and all the mangas, too. Soooo that's awesome. If they don't, you can always import from Book Depository. They ship internationally with no outrageous shipping fees. Anyone who has read translations -- what kind of insights do the novels provide? I've always wondered. They provide a bit more depth to Sora during his travels to find Riku. In the games he is portrayed as happy-go-lucky but in the novels he is a bit more aware of himself and the situation he is in. He's not super introspective but he has more thoughtful moments than in the game. Also prior to KH3D's confirmation, it provided the first hint that Axel might have been reformed as a human. Also just adds some moments that have the cast interacting with each other more. Good to finally have a solid date for the KHII novel. The Chain of Memories novel was fantastic so I will definitely pick this up too. In general one could say that the novels do a much better job in making you care for the characters than the games do. You get insight into people's thoughts, more interactions between people and in the specific case of the KH 2 novels, also a glimpse into some of the events that in the game happened 100% behind the scenes. And I'm especially hyped for this one, as it sounds like it has a lot of scenes that the game itself really could have used: Riku nearly getting into a fight with DiZ, and Namine holding him back from it (there's also some nice Axel and Namine interaction in that scene. And Riku and Namine deciding to go and save Kairi together, IIRC)... Riku fighting Xemnas, I think... Axel and Saix fighting, before Axel appears to help Sora... and Namine meeting HPO, but having to erase their memories of it, etc. I honestly can't get my hands on this soon enough! Thank you, Yen Press. Thank you. Has anyone ever translated the novels? This thread is literally about the translated novels being released. Is it rude that I imagined this being stated in a total deadpan voice with appropriate facial expression? Because I totally cracked up at the thought. Volume 2 is coming out still this December? Daaamn, I haven't even yet found time to properly read my imported Volume 1. Gotta need to notify my importer nonetheless.